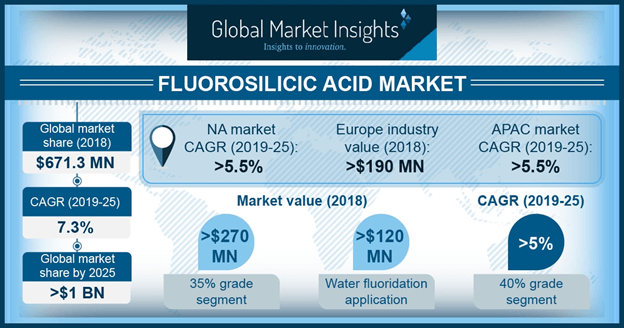 Fluorosilicic Acid Market size is set to surpass USD 1 billion by 2025; according to a new research report by Global Market Insights, Inc.
Increasing consumer consciousness towards safe public drinking water system may boost fluorosilicic acid market size. It is derived from the production of hydrogen fluoride and sodium fluoride. It is used by municipal corporation to maintain fluoride level in water and prevent dental problems in public, thereby driving the overall industry growth. Increasing product usage across textile and chemical processing industries may further stimulate the market size. Furthermore, hexafluorosilicic acid and the salts are utilized as wood preservative agents and act as an active ingredient, which in turn boost the fluorosilicic acid product growth. Fluorosilicic acid market demand from hide processing may witness consumption at over 25 kilo tons up to 2025. The product is added in an aqueous dispersion layer form to tanning bath during leather tanning process, making it soft and compliant, which may enhance the product growth. Fluorosilicic acid market size from electroplating may exceed gains at over 5% in foreseeable timeframe. It is used in various chemical industries which act as a catalyst to conventional chromium electrolyte. The product act as a reducing agent in these electroplating process, which may stimulate the product growth. Moreover, when added with lime, sand and calcium fluoride are sent to landfills as non-hazardous chemicals, which are further used to neutralize large oil spills that accumulate in containment vessels. U.S. fluorosilicic acid market size may witness growth at about 5.5% over the forecast period. Increasing public access towards fluoride sources through water or dental products like toothpaste, floss and mouthwash will stimulate the regional product demand. It is added to dental products as it aids in rebuilding tooth’s surface or enamel and reduce cavities, which is likely to drive the regional growth. Germany hydrofluorosilicic acid market size from water fluoridation was estimated at over USD 6.5 million in 2018. Absorption of fluoride in groundwater in the EU is usually low and some countries have further added the product to public drinking water as a health concern. EFSA has set up consumption levels related to natural mineral water and other sources of fluoride. Commission Scientific Committee on Consumer Products has set certain levels for fluoride in dental products, which may accelerate the market over the forecast timeframe. China fluorosilicic acid market size may exceed gains at 6.5% by 2025. The ease of raw material availability owing to which manufacturers in the region are able to offer their products at relatively low prices, may drive the product growth. Moreover, supportive government measures which focus in promoting investment in textile manufacturing sector may foster the industry growth. Honeywell, NAPCO, American Elements, IXOM and Fisher Scientific are the key industrial participants in hydrofluorosilicic acid market. Most of the industrialist are focused to develop innovative products to enhance the market growth over the predictable timeframe.